John T Rex, information worker, dragged himself out of bed. He worked long hours and never seemed to get enough sleep. Bleary-eyed, he threw on some clothes and stumbled out the door to the bus stop. As he reached his office, John groaned inwardly at the sight of unfinished reports from the day before. Pushing these aside, he logged on to his computer and began to trawl through his email. No sooner had he started to read his emails that he was interrupted by several unscheduled meetings. He looked at his watch � it was already one o�clock but there was no time for lunch. There was just too much to do. He rattled busily around his office for the rest of the afternoon, moving from one task to the next but never really finishing anything. The mountain of documents on his desk grew as colleagues stopped by his desk with requests for �urgent� tasks to be completed and, often irate clients rang up, demanding to know the status of their projects. He couldn�t seem to say no to new work. Every one wanted /their/ project done now and he seemed to be getting nowhere. Soon it was six o�clock. One by one, his colleagues waved goodbye, leaving for the day. John sighed and stared glumly at the photo of his wife at his desk. The romantic dinner he had planned for their 20th wedding anniversary would have to wait. She was going to be mad! John tried to get on top of his workload but days like these happened far too often. John took great pride in his job. He was the only one in the company who personally handed all facets of his job, including typing, filing and researching. For instance, John took pride in doing better research than the dedicated company research team! John was dedicated to ensuring that he did not miss a single detail in his work. He would often spend hours and hours diligently reading every detail of a research report, only to find that the report had very little information relevant to his projects. In fact, he was so busy ensuring everything was done to perfection for his clients that he had little time and regard for project status reports which were required at an unreasonable bi-weekly intervals. Who had time for status reports, when there was so much to do already? John�s network of friends on IRC all agreed that John was overburdened. John considered himself a hard worker. He couldn�t understand why the sales department kept hassling him. Just last week, the VP of sales had called him to complain that a late project John was managing had resulted in their biggest account moving their business elsewhere! How was John supposed to know how big the account was? Does John T Rex�s story sound familiar to you? Many of us battle with a seemingly endless barrage of tasks in our daily lives. There never seems to be enough hours in the day to complete everything we need to get done. So how do we avoid becoming like John T Rex? The answer is to become a better time manager. Time is a valuable resource which should be fully utilized. Learning how to manage our time properly brings many benefits. We have more time to spend on our leisure activities and see our families. We are less stressed and perform better at work. We are able to focus instead of trying to rush around and beat time. 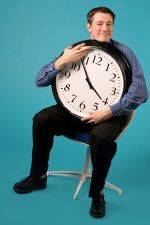 Continuing with our series on time management, this newsletter will show you how to avoid becoming like John T Rex and avoid those time- wasters. Like John T Rex, do you fuss over every minute detail of the tasks you have to complete, only to end up losing track of what you are meant to be doing in the first place? Ensure that your goals are specific, measurable, achievable, realistic and timely. Vague goals only serve to confuse. Prioritise and categorise your goals. Distinguish between long-term and immediate goals. Map out the relationship between your longer-term and shorter team goals, so you can see how it all fits in. Giving goals a priority status will help you make decisions and motivate you. Weigh up the benefits and costs of each decision against your goals. For example, if you decide to bypass an agreed project deadline to undertake additional research, you must ask yourself if this additional research is necessary. Will handing in a late project result in a significant loss of revenue for your client or employer? Is the information already gathered sufficient for your client�s requirements? Asking yourself whether the decisions support the goals will help you make better decisions. In John T Rex�s case, his failure to make decisions based on the goals, resulted in the loss of his company�s largest account. Don�t let that happen to you! Use goals for all tasks � big or small. John T Rex often wasted many hours poring over every detail in reports and documents only to discover at the end that these did not contain relevant information. To avoid this time-wasting trap, constantly remind yourself of what you are trying to achieve when performing tasks. While it may be interesting to read that the average American consumes 60 hot dogs per year, this information will not enhance your knowledge of America�s economy. Skimming, by reading indexes and headings, can tell you whether you need to read sections at all. Like John, are you such a perfectionist that you refuse to let others help you with your workload? In today�s demanding business world, with ever increasing informational needs and tightened deadlines, it would be foolish not to learn to delegate. Delegation has many time-saving benefits. The principal benefit is that it allows you to have more free time to concentrate on important tasks. Effective delegation involves knowing exactly what needs to be achieved and communicating these objectives to your subordinate. Ensure you outline the expected end result of the task. If you don�t know the end result, you cannot expect your subordinate to either. Identify the need for additional guidance or training. Determine if your subordinate needs additional support to perform the task, and if so, how this support will be provided. Allow room for mistakes and lessons to be learned from these mistakes. Be willing to delegate and provide the necessary training, as this will enable both you and your subordinates to develop vital skills. Ensure you include feedback mechanisms. Effective delegation involves seeking feedback from subordinates about their progress and concerns. Open lines of communication will ensure that tasks are completed to your expectations and any problems are promptly dealt with. Communicate to others that you have delegated a task. Letting others know that you have delegated a task allows your subordinate a sense of ownership and responsibility toward the task. This provides your subordinates motivation and enables them to make decisions on your behalf. Why not delegate reading some of the pile of documents to subordinates? Ask them to prepare a one page summary and a recommended action plan if they think it requires your attention. Are you, like John T Rex, running from one task to the next but achieving very little? Make a daily to-do list and order your tasks from most important to least. When you see how your daily tasks connect to your long-term goals, you will be more motivated to complete them. For example, if John T Rex had related the bi-weekly project status reports to the larger goal of being responsive to client needs, he might have made these reports a higher-priority task. Cut projects into definable stages with individual deadlines. This makes them look less formidable and allows for the evaluation of project performance at each stage. Make sure you have high-priority tasks within easy reach so that it is more difficult to avoid them. Once you identify possible distractions, find ways to avoid them. You may not even realize how much time distractions take up. John T Rex�s fondness for IRC is an example of a major time-waster. Chat programs such as IRC and MSN, as well as personal emails and text messages, have been found to be incredibly distracting in the workplace. Research has shown that the constant distraction of text messages, chatting and email, can lower a person�s I.Q. by up to ten points at work. Procrastination is often caused by doubts and concerns about the task. Do you have inadequate information to proceed? Are you unsure of how to complete the task? Are you afraid that the project you are working on may have unethical outcomes? Once you figure out what the barriers are, you can deal with them and move on with the important job of completing the task. So, back to John T Rex. He didn�t know how to combat his time-wasting ways and as a result, continued to slave away until 11pm. When he got home that night, he was tired, grumpy and starving. On top of that, his wife had gone to bed, angry that he had missed their anniversary dinner. Don�t let your day turn out like his. Learn to manage your time effectively and you can enjoy all the benefits of life � a successful career and plenty of leisure time..
FREE trial - Speed Reading software. Imagine how your studies and career could be transformed by fast accurate reading! Try it FREE. download here.